Solve Prob. 216 if rod AB is of steel, with E = 29 × 106 psi. Assume α = 45° and θ = 30°; all other data remain unchanged. As shown in Fig. P-216, two aluminum rods AB and BC, hinged to rigid supports, are pinned together at B to carry a vertical load P = 6000 lb. If each rod has a cross-sectional area of 0.60 in.2 and E = 10 × 106 psi, compute the elongation of each rod and the horizontal and vertical displacements of point B. Assume α = 30° and θ = 30°. Compute the shearing stress in the pin at B for the member supported as shown in Fig. P-119. The pin diameter is 20 mm. 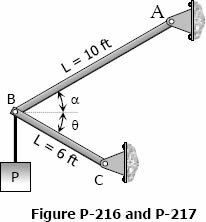 A 200-mm-diameter pulley is prevented from rotating relative to 60-mm-diameter shaft by a 70-mm-long key, as shown in Fig. P-118. 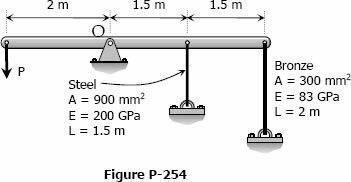 If a torque T = 2.2 kN·m is applied to the shaft, determine the width b if the allowable shearing stress in the key is 60 MPa.